Feature film VFX has become an ever larger part of our business since our first job on the Book of Eli in 2009. 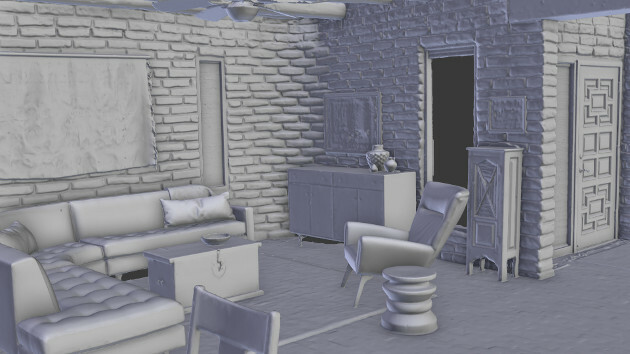 Whether you need reference data for set extensions or camera tracking, want to digitize production assets, or pre/post-visualize locations we can provide everything from minimally processed point cloud data sets to fully textured retopoed meshes. We are qualified vendors in New Mexico and Georgia, but also work across the country and around the world. Most of our VFX clients want untextured meshes which we can easily provide. We also regularly provide registered point clouds to VFX companies with pipelines setup to ingest them. Any of the other standard data products listed below can also be provided upon request and we are always happy to develop custom solutions when needed. This is the simplest type of data we commonly provide. It consists of 3D vertices measured by the scanner with optional attributes such as color or point normal. Vertices can be decimated to achieve a specific point spacing or maximum point count. Untextured meshes are derived from the original point cloud. Intersecting faces are removed and we do our best to eliminate poor topology that may cause rendering artifacts. As with point clouds we can deliver meshes with specific face sizes or counts and we typically deliver multiple versions from low-resolution proxies to dense high-poly meshes. For objects that were completely scanned the mesh can be water tight. Meshes are usually delivered as Wavefront .obj files although other formats can be provided. Our most accurate meshes are built using lidar to capture scene geometry and photogrammetry to record color. Alternatively, meshes can be built entirely using photogrammetry. Photogrammetry is faster and less labor-intensive, however, it may produce less accurate results and is highly dependent on lighting conditions and object characteristics. Our photo textured meshes have the same features as the untextured meshes described above with the addition of a UV map and a 8k or 16k scene-referred linear photo texture map. Finally, we can also produce hand modeled or retopoed low-poly meshes. Of course, these models can also be texture mapped using the same methods described above.